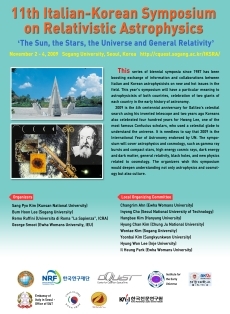 This series of biannual symposia since 1987 has been boosting exchange of information and collaborations between Italian and Korean astrophysicists on new and hot issues in the field. This year’s symposium will have a particular meaning to astrophysicists of both countries, celebration of two giants of each country in the early history of astronomy. 2009 is the 4th centennial anniversary for Galileo’s celestial search using his invented telescope and two years ago Koreans also celebrated four hundred years for Hwang Lee, one of the most famous Confucius scholars, who used a celestial globe to understand the universe. It is needless to say that 2009 is the International Year of Astronomy endorsed by UN. The symposium will cover astrophysics and cosmology, such as gamma ray bursts and compact stars, high energy cosmic rays, dark energy and dark matter, general relativity, black holes, and new physics related to cosmology. The organizers wish this symposium to deepen understanding not only astrophysics and cosmology but also culture.